When renown Islamic Caliph Abd al-Malik ibn Marwan penned an ode to his beautiful beloved Layla, it is believed that he was inspired by a graceful gazelle. O likeness of Layla, never fear! For I am your friend, today, O wild deer! You are free for the sake of Layla, forever! After seeing the defenceless animal, Abd al-Malik ibn Marwan was fascinated with its beauty and elegance, traits which reminded him of his Layla. The word 'gazelle' is derived from the Arabic word 'gazal' which roughly translates to 'feminine beauty', so it's no surprise that the gazelle was Abd al-Malik ibn Marwan muse. As a member of the same animal family, gazelles and antelopes symbolize the many of the same virtues in their indigenous regions. In order to survive their surroundings, these animals have to be extremely alert and aware of the changes in their environment and be ready to act quickly. As such, they are renowned for their speed and agility. For this reason, the Gazelle is often linked with the wind. In Asian cultures, an antelope's antlers are used in medicine and is often consumed as an aphrodisiac. However the opposite is true in the Christian realm. Antelope antlers are seen as weapons in the fight against evil and two antlers are representative of New and Old Testaments of the Bible. Whether or not you love antelopes or gazelles, one thing is clear; nothing in this world beats their serenity and grace. 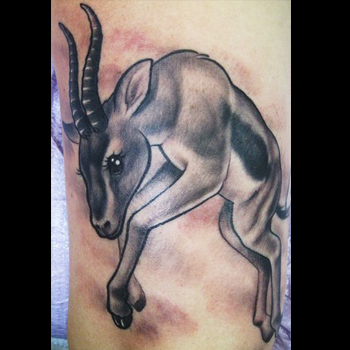 Antelope and Gazelle Tattoos are relatively rare pieces of body art, since many persons don't readily identify with these wonderful animals. In fact, it isn't unusual for people to mistake gazelles for deer. Even so, the most common depiction of the creature is when it is in full gallop, since this image truly brings out the animals' beauty, elegance, and grace. When choosing the right tattoo, it pays to invest a little time in figuring out where you intend to place it on your body and what your new artwork will symbolize. Remember that your new ink isn't easily erased so the best designs are those that will have special significance to you whether you've been wearing it for 20 minutes or 20 years. Our team can help you to design a truly unique piece. Simply visit our design page at www.itattoodesigns.com and take advantage of our Custom Service.